The memory is not what it was. I find that I have hitherto recommended you to visit Word Pangs, which is a highly entertaining blog; and indeed it's on my blogroll. But it's well worth mentioning again. Word Pangs often features quotations which are relevant to the writer's situation and the book trade in general. And some of them are mine. 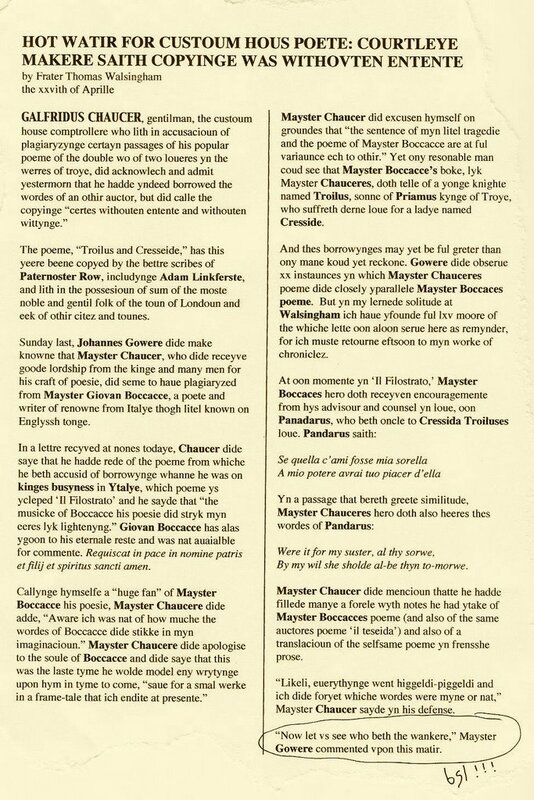 In case you missed James Morrison's comment on the Kaavya phenomenon, it's worth following his link: the page which appears is a little hard to read (in my browser at any rate) but will provide some harmless amusement to those who ever struggled to read Chaucer. Tip: if you're really interested, note that this web page is a jpg. Right click it, use Save as to put it on your hard disc, open a photoediting program, open the jpg, and enlarge it a bit. At 100% it reads just fine. And, although it's a bit of lighthearted fun, it is also relevant to the plagiarism discussion. An extract from Richard Rathwell's Red the Nile, Blue the Hills has been posted on the Blue Orange blog. The book is carried by wholesaler Bertrams so should be available from most bookshops. On the Creative Commons blog, in an interview with Mike Linksvayer, John Sundman describes how he finally grew up in terms of his attitude to the web. At first, round about 1999/2000, John posted parts of his novels on the web, to advertise them, and was paranoid about anyone getting hold of the entire text for free. Then he realised that the average novelist's biggest problem is not having his books ripped off -- it is the fact that no one in the world either knows or cares about what he's done. And so from then on John posted his stuff in its entirety, as free PDFs. Result? Well, if not happiness, at least a degree of satisfaction with the result. PS. Does John's 1999/2000 attitude remind you of anyone? Hint: think about the big fat commercial publishers, with their elaborate DRMs and their warnings plastered all over any free PDFs that they do distribute, e.g. to the odd (very odd) blogger like me. As if anybody in their right mind would voluntarily pass on the PDF of a Michael Cunningham novel anyway. If you want to read any of John Sundman's books, go to his wetmachine site. He is described as a 'gonzo SF novelist', by the way. Whatever that is. I've just read chapter 1 of Acts of the Apostles, and it is clearly the work of a man who knows what he's doing. But I have a comment (which you will have come across before on this blog but will probably have forgotten): All information for the reader is best conveyed in the course of a scene; a scene in which human beings address each other, and in which an emotional and intellectual interchange takes place. That way the reader is much more quickly involved in the story than if you just tell her things with your author's hat on. Towards the end of Acts of the Apostles chapter one, we do get a scene, and things improve no end. I will probably read the rest. In the Observer yesterday, Robert McCrum made encouraging noises about the IT revolution and how it affects traditional publishing. Of which, no doubt, more on this blog later. If you have somehow escaped hearing about how James Patterson's fiction factory operates, the Guardian today gives you a description (link from booktrade.info).